On Monday, the World Health Organization declared a "public health emergency of international concern" due to the cluster of birth defects potentially linked to Zika virus. No one is probably more concerned about this connection than the world’s pregnant women, especially those who are living in an area where there is ongoing Zika virus transmission. While the virus’ symptoms (fever, headache, joint pain, conjunctivitis) are no cause for alarm and rarely require hospitalization, the disease is suspected of causing severe birth defects like microcephaly, when a baby is born with an abnormally small head. Scientists fear that exposure to Zika virus in the womb may cause some fetus’ brains to stop developing normally, resulting in potential lifelong setbacks like intellectual disability and developmental delays. The "PHEIC" designation, only the fourth of its kind in WHO history, will draw international resources to help study the association between the mosquito-borne disease and devastating birth defects like microcephaly, potentially expediting research on diagnostic tests, vaccines and cures for the disease. WHO Director-General Dr. Margaret Chan emphasized that the PHEIC declaration was not a ban on trade or travel. Because Zika virus itself has such mild symptoms, officials explained, it doesn’t warrant such restriction. This echoes WHO’s similar caution against trade and travel bans during the 2014 to 2015 Ebola outbreak in West Africa. 2. But pregnant women should consider postponing any trips to affected areas. Chan said that pregnant women could consider delaying their travel to a Zika virus-affected area. If a woman does need to travel, she should get advice from her doctor first and take special care to prevent mosquito bites. This advice echoes the U.S. Centers for Disease Control and Prevention’s strong warning that pregnant women in the U.S. postpone travel to a Zika-affected destination if possible. The CDC also advises women who want to become pregnant to talk to their doctors before making the trip. The agency has upgraded 30 countries and territories with ongoing Zika virus transmission to a “level 2” health warning as of Wednesday. These countries and territories are: American Samoa, Barbados, Bolivia, Brazil, Cape Verde, Colombia, Costa Rica, Curacao, Dominican Republic, Ecuador, El Salvador, French Guiana, Guadeloupe, Guatemala, Guyana, Haiti, Honduras, Jamaica, Martinique, Mexico, Nicaragua, Panama, Paraguay, Puerto Rico, Saint Martin, Samoa, Suriname, Tonga, Venezuela and the U.S. Virgin Islands. 3. If you have to travel, cover up. Barring postponement, pregnant women and all people who travel to these 28 destinations should follow strict mosquito bite prevention protocol by wearing long sleeves and pants, using insect repellant and treating their clothes and gear with the insecticide permethrin. Once back from their trip, pregnant women should be sure to tell their OB/GYN about their travel so that they can come up with a schedule for monitoring the fetus' growth over the course of the pregnancy, advises the CDC. Dr. Amanpreet Bhullar, an OB/GYN at Orlando Health Physician Associates, praised WHO’s actions for the message it sends to the general public -- especially pregnant women. "[Its] impact on decisions to avoid travel and behaviors to minimize risk of infection will hopefully help to keep the number of mothers and infants affected to the lowest number possible," she told HuffPost. 4. And if you live in a Zika virus-affected area, the protocol's the same. During the PHEIC announcement, Chan directly addressed the millions of pregnant women living in areas with ongoing Zika virus transmission. Like travelers, they should wear long-sleeved shirts and pants, as well as mosquito repellant. And because the Aedes aegypti, the mosquito that transmits Zika virus, is an aggressive daytime biter, she also advised pregnant women to minimize outdoor activities and sleep under a mosquito net if they take afternoon naps. Countries should also make sure women of childbearing age and pregnant women have all the information they need to reduce risk of Zika virus exposure. Pregnant women who believe they have been exposed to the virus should also be counseled and followed for birth outcomes, according to advice WHO released when declaring the PHEIC. 5. Experts are still investigating the microcephaly-Zika virus connection, but it appears likely. 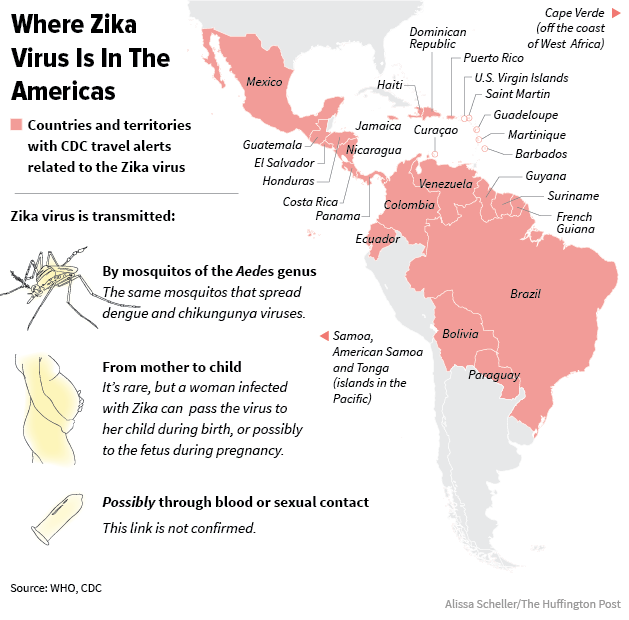 Chan acknowledged there’s no definitive proof that Zika virus can cause birth defects, but she did say there was a “strong association in time and space” between Zika infections and a rise in birth defects and neurological complications. The rise in babies born with birth defects in Brazil coincides with the largest-ever Zika virus outbreak to date. 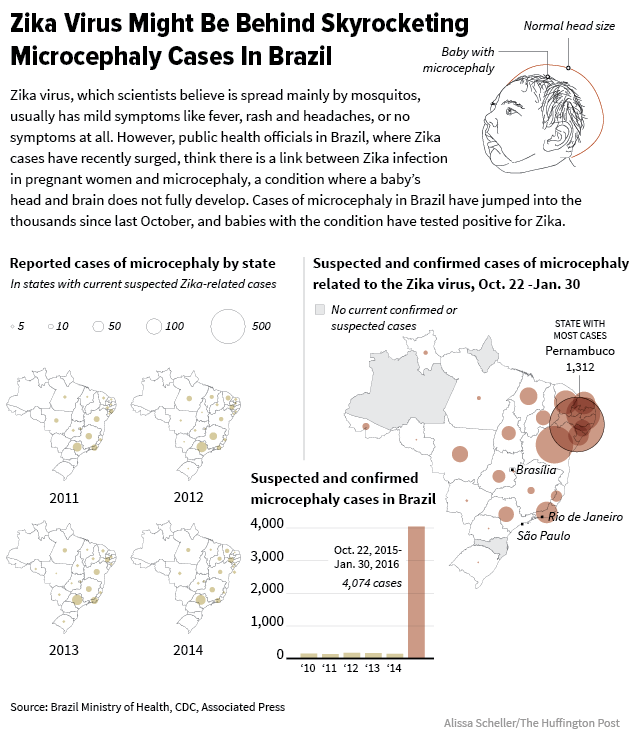 Brazil notes that Zika first began spreading May 2015; the country recorded more than 4,000 reported cases of microcephalic births between Oct. 2015 and Jan 2016. As of Jan. 23, health officials are continuing to investigate these initial diagnoses and have been able to confirm 270 and discard 462 of them. Zika virus broke out in French Polynesia beginning in 2013, and an estimated 11 percent of the population sought treatment for symptoms. Health officials there released a report about 17 cases of central nervous system abnormalities in fetuses and infants during 2014 to 2015, around the same time the virus was spreading throughout the islands. None of the mothers involved reported experiencing Zika virus symptoms, but four of them did test positive for some kind of previous flavivirus infection, the genus of viruses that includes Zika.